Things can get interesting when a deal goes bad. Boba Fett at his blaster-blazing bounty hunter best! Those Mandalorians can get a bit testy when a deal sours, as seen in this fantastic Star Wars Deal Gone Bad by Jon Siva Paper Giclee Art Print featuring Boba Fett. 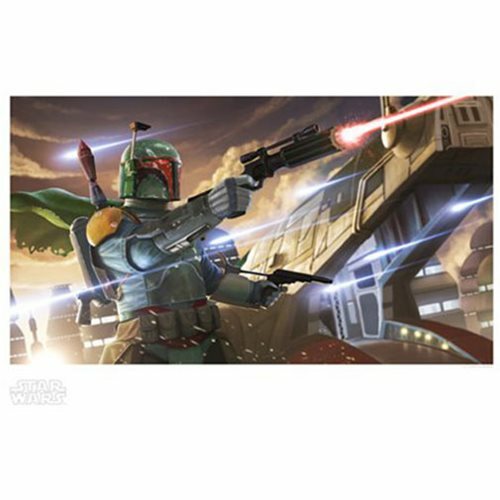 This magnificent unframed interpretive artwork by artist Jon Siva measures 19-inches wide x 13-inches tall (image is 18-inches wide x 10-inches tall) and presents an exciting image of the fearsome bounty hunter with blasters blazing. It's a hand-numbered limited edition of only 125 pieces that includes a certificate of authenticity.